The Fenix E21 Flashlight is an easy-switching two-stage light, which is an exquisitely made portable outdoor flashlight. The Fenix E21 uses the LED bulb with a very efficient reflector to deliver an outstanding balance between flood and hotspot. It comes with 2 modes, one high at 170 lumens and one low at 54 lumens. Slightly longer than your typical Surefire or Streamlight, the Fenix E21 has the tactical push-button tailcap switch for quick on/off but also yields the twist motion to give change between the high/low modes. It uses the widely available AA batteries, which is most popular in this price range of flashlight. 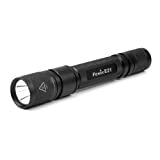 The Fenix E21 flashlight is a great flashlight to keep in the car, tool box, tackle box, on the boat, or by the front door. This little light shines one and half football fields in distance and is strong enough to blind an intruders eyes. There are so many uses for the Fenix E21 flashlight for being such a reasonably priced light.